Window washing is one of those chores that seems simple enough until you actually do it. As soon as the streaks start to appear on the glass surface or the smears and residue remind you that you’re using the wrong cleaner or the wrong tool, an overwhelming sense of confusion may quickly emerge within you. Fortunately, here’s a guide to lighten that load by walking you through the proper way to wash your windows. By following these steps, you’ll be able to get your windows cleaned and cleared within a fraction of the time spent otherwise. Instead of investing in high-quality and high-price equipment, you can get a lot done with such simple yet satisfactory tools as a 12-inch squeegee. You’ll also need to have a bucket and towels or clothes along with a hand dishwashing liquid. As the cornerstone of the window cleaning process, it’s imperative to keep a sharp rubber blade on your squeegee. It’s recommended to invest in at least 3 squeegees and alternate usage between them and their blades to prolong their lives. Never hesitate to replace a blade if it gets sliced, nicked or rounded while in use. Another helpful tip is to make sure nothing touches the blade while in storage to prevent undetected damage. It’s preferred to go with a 5-gallon plastic tub, or something you’re comfortable with moving from window to window. For small window panes, all you really need is a high-quality sponge. 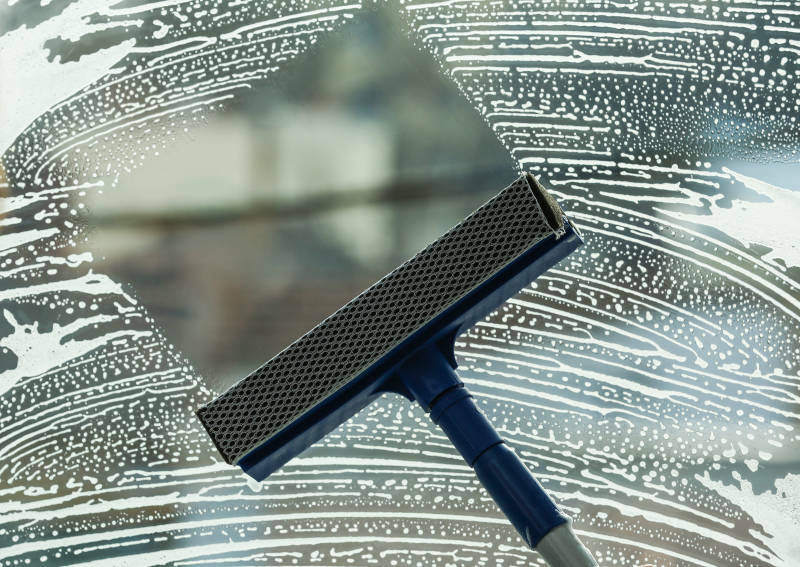 However, if the glass pane is medium or larger, you should use a high-quality scrubber for added efficiency. A common mistake is to use paper towels to clean windows. Paper towels are great for cleaning spills on a table, but horrible choices for cleaning blemishes and dirt on a glass window. In addition to the streaks left by paper towels, you’ll also leave trails of lint behind. Using soft, lint-free cloths or towels is essential. “Water is water.” It’s easy to follow this misconception when filling your plastic bucket before you begin washing windows. However, numerous studies have proven that this line of reasoning is a dead-end street. For instance, when the weather is warm, you should use cool water to enhance your efficiency and overall productivity. If it’s below freezing, it’s recommended to add windshield washing solution to prevent the water from freezing when placed on the glass. The same water you use to fill the bucket may also be the same water you use to dilute the cleaner. This is another misconception that can lead your approach to cleaning windows down the wrong road. When diluting glass cleaner, you should use distilled water. The vast number of minerals that are present in the water poured from the faucet can leave behind streaky deposits as you clean regardless of how skilled you might be with a squeegee. After you’ve dipped your scrubber into the filled bucket, take the time to squeeze out any excess water. You only need enough water to clean the window, not create a bigger mess that’ll require more cleaning. As you scrub the window, make sure you clean the edges from all angles and cover every single inch of the glass. Whether you use horizontal or vertical strokes with the squeegee doesn’t necessarily matter. Remember, if you decide to use vertical strokes, angle your squeegee in a way that directs all the extra water to the uncleaned parts of the window for added efficiency. Not only will this save time, but also conserve your energy since you’ll get the same results without having to exert yourself as much – working smarter, not harder. The best way to start is by creating a “starting strip” with your squeegee. Tip this tool to ensure that the corner of the squeegee is the only part that contacts the glass. Clean a narrow and straight strip of glass from the top corner to the bottom corner of one side. It may seem like an insignificant step, but it’ll lighten the load of starting your horizontal (or vertical) strokes for the rest of the window. Make sure you take a steady approach to pulling the squeegee across the glass, keeping the squeegee blade firmly pressed up against the surface the entire time. Focus on keeping the top of your tool pressed against the window’s top edge. Pay attention to how the glass responds to your stroke pattern to ensure you get the most desirable results from your work. Remain consistent with your stroke pattern; do not alternative between horizontal and vertical strokes while cleaning a single glass pane. Doing so will increase the chances of creating streaks and damaging your squeegee blade as you clean the window. When it’s time to wipe the blade clean to remove the extra water or dirt and grime removed from the window, you can do this efficiently by wiping the blade across your scrubber or wiping the blade with a clean towel. As you transition from stroke to stroke, make sure that you always start by overlapping the previous stroke with the top of the squeegee by about 2 inches. This may seem as if you’re doubling your workload. However, this approach allows you to maximize your results and minimize the time you would otherwise spend applying additional strokes to the same areas. As you work the squeegee across the glass surface, remember to do so at an angle that shifts the extra water downwards. Do not underestimate the power of the wiping process after you scrub the glass surface. If you followed the cleaning approach outlined above, you’ll notice that an accumulation of extra water rests at the bottom edge of your window. Use a soft towel or cloth to wipe that excess water without creating any blemishes or streaks on the actual glass surface. You can then use your finger to guide a different lint-free cloth along the perimeter of the glass surface. This will help you to remove any suds or spots left behind by the cleaning solution or water. Make sure that you alternate rags as soon as there are no more dry spots on the cloth used. Otherwise, you’ll risk tarnishing your hard work by adding streaks to the window moments before you would’ve otherwise been finished cleaning it. If you wonder how a professional window cleaner can get the job done in a fraction of the time without compromising the quality of their work, it’s because they combine experience with efficiency. 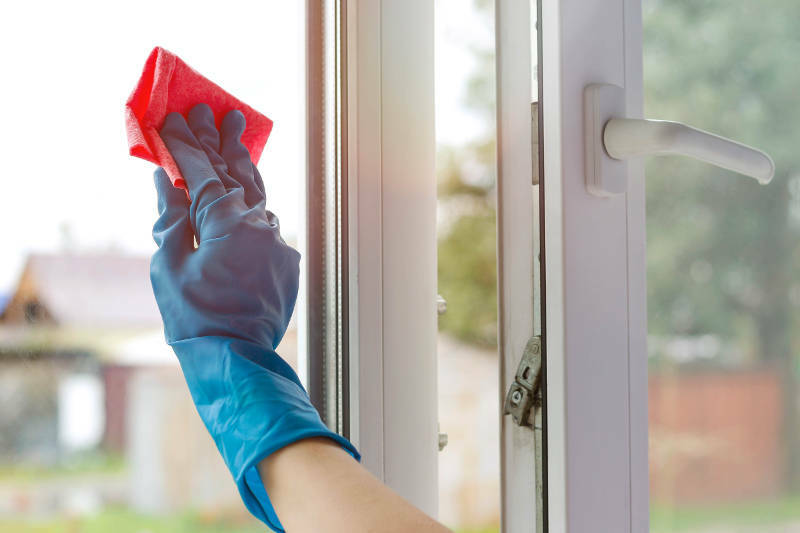 Using the approach referenced above to washing your windows may seem to take more time instead of less time when you first start using it. Do not become discouraged. As you become more comfortable with the process and experienced in getting results, you’ll quickly notice that you have a “professional” touch, talent and skill set for washing windows. If you find that your windows are past their prime and cleaning them isn’t enough to keep them looking great, it may be time for replacement. If so, homeowners trust Feldco for all their replacement window needs in Green Bay as we’ve been serving the Midwest for over 40 years. Get a free quote now and start your project with Feldco.